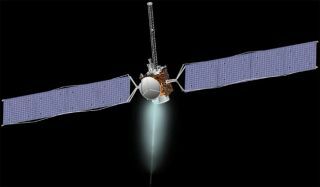 NASA?s Dawnspacecraft bound for the solar system's two largest asteroids has aced the firsttest of its ion propulsion system, the space agency said. The system willenable Dawn to make the eight-year, three billion-mile (4.9billion-kilometer) trek to the asteroid Vesta and dwarfplanet Ceres. "Dawnis our baby and over the weekend it took some of its first steps," saidDawn project manager Keyur Patel of NASA's Jet Propulsion Laboratory (JPL) inPasadena, Calif. "We have two months more checkout and characterizationremaining before Dawn is considered mission operational, but this is a greatstart." Spacecraftcontrollers fired up Dawn's ion drive on Oct. 6 and continued monitoring thesystem?s performance over the next 27 hours. The ion engines consumed less than10 ounces (0.28 kilograms) of xenon propellant – not even the equivalent of acan of soda – compared to the 937 pounds (425 kilograms) of Dawn?s onboard fuelsupply. That energy efficiency will permit the three ion engines to fire continuouslyfor more than five years, a record for spacecraft, mission managers have said. The ionengines were tested at five different throttle levels and performed?flawlessly? according to Jon Brophy, the Dawn project's ion propulsion managerat JPL, in an official statement. Charged ion particles shoot out of theengines at 90,000 miles per hour (144,840 kph) to slowly accelerate thespacecraft over time. Dawn isslated to arrive at Vesta in 2011 and spend about a year studying the spacerock before meeting the dwarf planet Ceres in 2015. The spacecraft will measurethe asteroids' shape, surface topography, tectonic history, elemental andmineral composition, and look for water-bearing minerals. Scientists will alsouse Dawn?s orbit around Vesta and Ceres to gauge mass and gravity fields. NASA's Dawnmission launchedon Sept. 27 from Cape Canaveral, Florida.